The Cumans are a nomadic Turkish people occupying the area north of the Black sea, who are often employed as mercenaries. 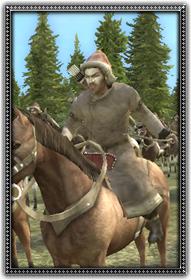 Accustomed to a life in the saddle, they are excellent light horse archers equipped with powerful composite bows. They prefer to avoid hand to hand combat though.